February 16, 2015 By Allyson 1 Comment This post may contain affiliate links. Read my disclosure policy. I really love making frittata’s for several reasons, however, the main reason would be that they are absolutely delicious. Frittatas can pretty much handle whatever veggies or meats you want to throw at them, and I often find myself making them when I have extra eggs, vegetables, or cheese. I’ve never met a frittata I haven’t liked. 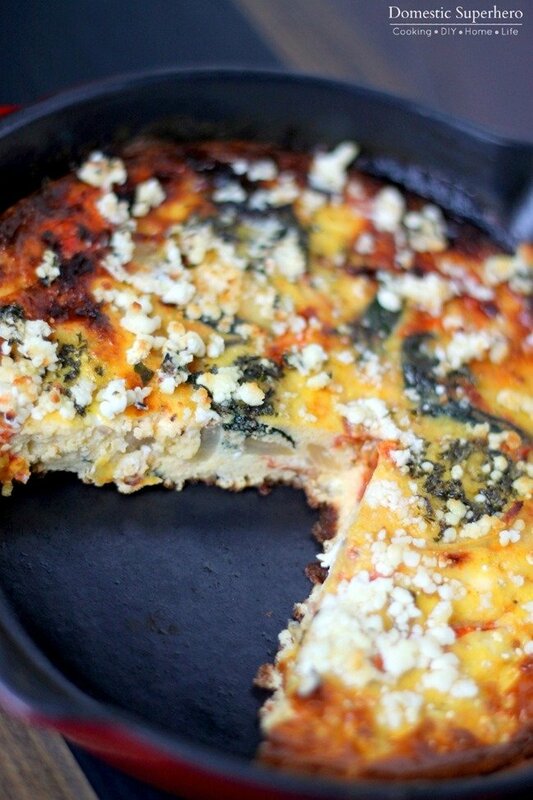 The key to making a great frittata is adding a bit of dairy – full fat, not watery skim milk. I have made them using whole milk, cream, half and half, and also greek yogurt. Whatever you use, make sure it has fat. A frittata is very healthy, so adding a bit of this fat shouldn’t be intimidating if you are trying to eat healthy. When I had a ton of veggies about to go bad in the fridge, I decided to make this delicious Roasted Vegetable Frittata. I love using my cast iron pans for frittatas because the cleanup is really easy and I feel like they cook them the best. Make sure that you take the frittata our just a minute or 2 before you think it’s totally done, because the pan will hold heat and keep cooking the frittata. I added goat cheese to the top of this frittata (yummmm), but it would also be great with feta, gruyere, swiss, or even ricotta chunks…point is, you can’t go wrong with the cheese…pick your favorite and let it ride. 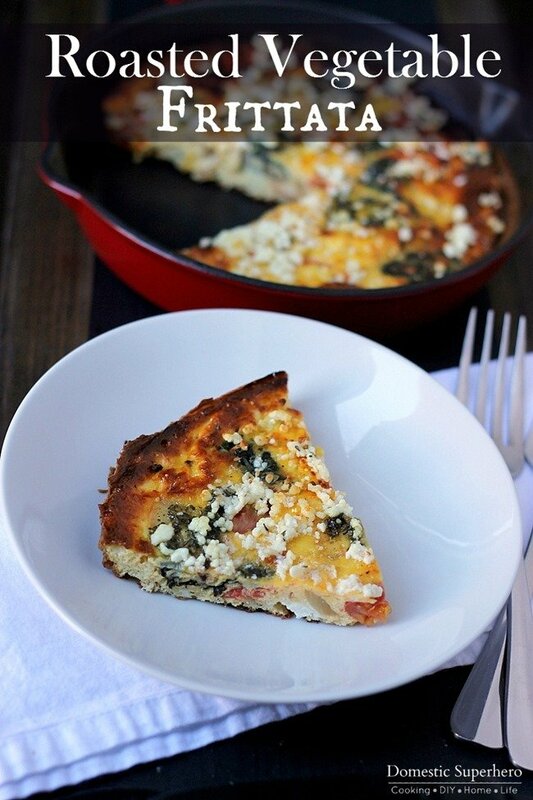 Another reason I LOVE frittatas is because they are virtually great for any meal. I usually make a big one for dinner, than I eat the leftovers the following days for breakfast and lunch. 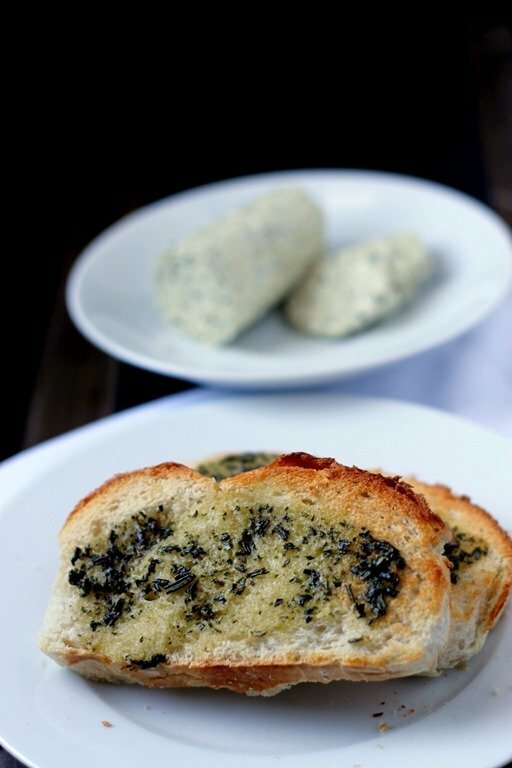 Often I will toast up some bread and throw a slice between the slices as a lunch sandwich – so good. 1. Preheat oven to 400 degrees F. In a large baking sheet, add asparagus, tomatoes, and onion. Drizzle Olive oil over the top, and then sprinkle salt and pepper over top. Toss well with hands to coat evenly. Place into oven and roast for 15 minutes. Stir vegetables and then add the spinach into the baking dish, stirring once and then roasting an additional 5-7 minutes, or until spinach is wilted and vegetables are cooked through. Remove from oven and set aside. 2. In a large bowl, add 12 eggs; whisk. Add milk, basil, oregano, thyme, and a dash of salt and pepper to the bowl. Whisk well to combine. 3. In a large oven safe skillet (if it has a metal handle, you can just cover it with foil), heat over medium high heat and coat with non stick spray. Pour egg mixture into the skillet, and then pour roasted vegetables into the skillet. Stir with a wooden spoon until vegetables are evenly distributed. Cook for 3-4 minutes over medium high heat, then remove from heat and place into 400 degree oven. Cook for 20-25 minutes or until eggs are just set. Remove from oven and top with goat cheese crumbles. Allyson, I love frittatas too, for the same reason– very easy to make, healthy and so versatile. 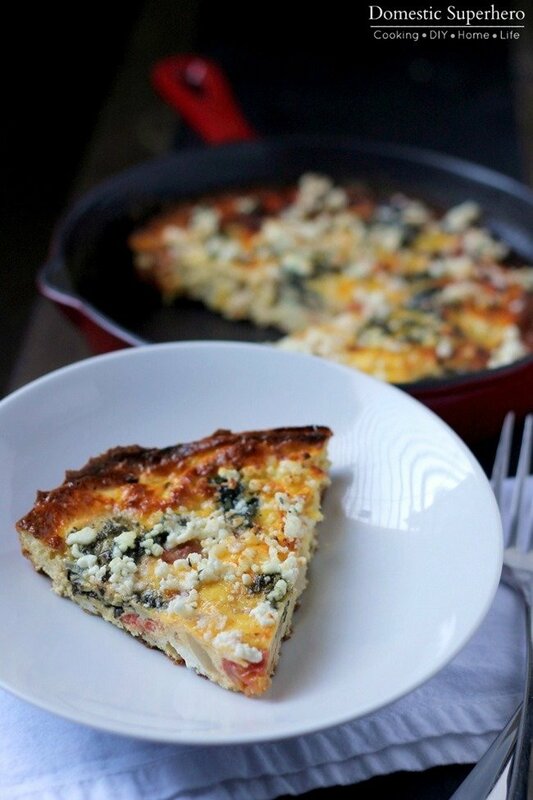 I have a kale and tomato frittata on the blog, I used all egg whites in it. For some reason I haven’t thought of using my cast iron skillet, I will try that next time. Roasting the veggies cuts down the amount of liquid– a perfect solution for a frittata.